A temperature limited fed-batch (TLFB) technique is described and used for Pichia pastoris Mut+ strain cultures and compared with the traditional methanol limited fed-batch (MLFB) technique. A recombinant fusion protein composed of a cellulose-binding module (CBM) from Neocallimastix patriciarum cellulase 6A and lipase B from Candida antarctica (CALB), was produced and secreted by this strain. A protein concentration of about 1 g L-1 was produced in the MLFB process. However, this product was considerably degraded by protease(s). By applying the TLFB process, the yield was increased to 2 g L-1 full-length product and no proteolytic degradation was observed. Flow cytometry analysis showed that the percentage of dead cells increased rapidly during the initial methanol feed phase in the MLFB process and reached a maximum of about 12% after about 40–70 hours of methanol feeding. In the TLFB process, cell death rate was low and constant and reached 4% dead cells at the end of cultivation (about 150 hours methanol feeding time). The lower cell death rate in the TLFB correlated with a lower protease activity in the culture supernatant. The specific alcohol oxidase (AOX) activity in the TLFB process was 3.5 times higher than in the MLFB process. Three mechanisms that may contribute to the much higher accumulation of product in the TLFB process are: 1) reduced proteolysis due to lower temperature, 2) reduced proteolysis due to lower cell death and protease release to the medium, 3) increased synthesis rate due to higher AOX activity. The methylotrophic yeast Pichia pastoris is commonly used to express recombinant proteins under the control of the strong, tightly regulated, and methanol-induced alcohol oxidase promoter AOX1 . P. pastoris has the potential for high expression levels [2–4], efficient secretion of extracellular protein , post-translational modifications such as glycosylation , and growth to high cell densities on minimal medium in bioreactor cultures . It is only in the controlled environment of a bioreactor that it is possible to achieve high cell densities, due to toxicity of the methanol [6, 7]. Unfortunately, due to secretion of proteases to the medium, and possibly also due to release by lysis, proteolytic degradation is a significant problem in many high cell density cultures. This problem is often mentioned in connection to standard methanol limited fed-batch P. pastoris processes . In this context, a number of adjustments to the standard P. pastoris process have been reported, including changing the cultivation pH or the temperature and adding casamino acids and peptone [4, 8–12]. This work describes the use of an alternative fed-batch technique, the temperature limited fed-batch (TLFB), in which the common methanol limitation is replaced by temperature limitation, in order to avoid oxygen limitation at high cell density. 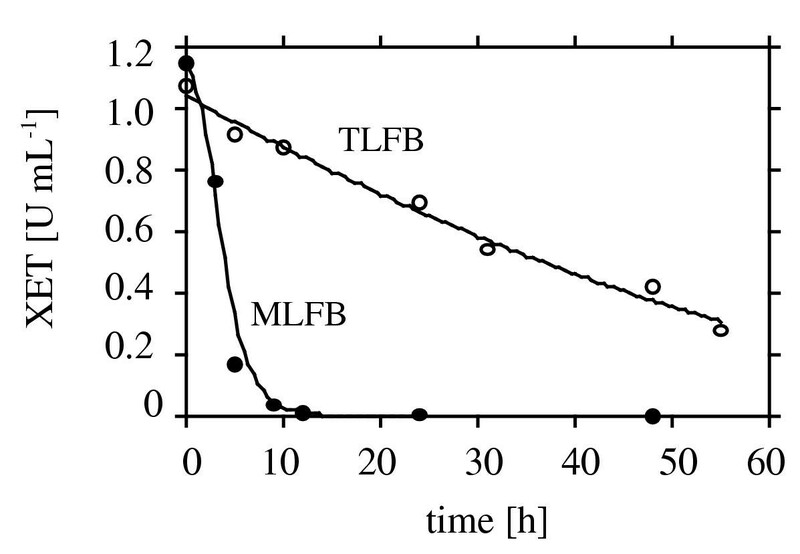 When applied for production of a fusion protein, the TLFB technique resulted in higher cell density, lower cell death, higher concentration of the product and drastically lower proteolytic degradation of the recombinant protein compared to corresponding methanol limited P. pastoris bioreactor cultures. 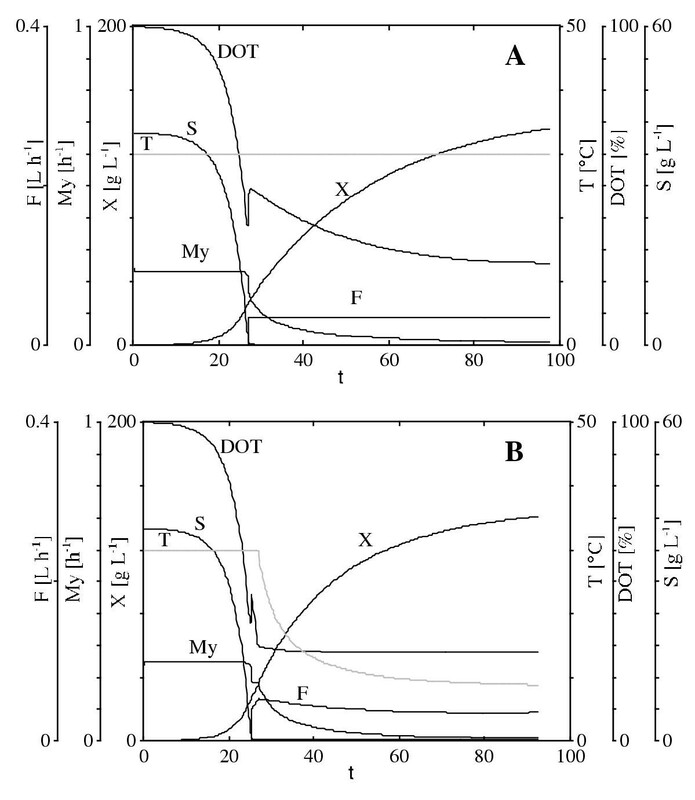 Thus, the specific growth rate (μ, also designed My in Figure 1) declines in proportion to the increased biomass (XV) while OCR and DOT are approximately constant. The higher the biomass becomes, the lower becomes the specific growth rate. It is a consequence of the Monod kinetics that this declining growth rate is related to a corresponding declining quasi-steady state substrate concentration (S) as illustrated in Figure 1A. A: Characteristics of a substrate limited fed-batch technique with constant temperature. B: Characteristics of a temperature limited fed-batch technique in which the substrate concentration is controlled at a non-limiting concentration while DOT is controlled at a set-point by means of the temperature controller. Parameters in A and B correspond to growth of P. pastoris on glycerol which promotes cell accumulation only. After a certain cell density is reached, the production phase can be started by a shift to methanol feed. F: feed rate; X: biomass concentration; My (μ): specific growth rate; T: temperature; DOT: dissolved oxygen tension; S: substrate concentration. With the TLFB technique, the required declining growth rate and constant DOT are obtained by a declining temperature that keeps DOT at a constant level (Figure 1B). If all substrate components are present at non-limiting concentrations, the cells always grow at μ-max at the actual temperature but the higher the biomass, the lower the temperature must be. This relationship between growth rate and temperature is usually described with the Arrhenius plot (Figure 2). This plot shows that P. pastoris is a quite psychrotrophic organism that can grow at a temperature as low as 12°C with the specific growth rate μ = 0.04 h-1. In high cell density P. pastoris cultures, the growth rate reaches even much lower values . Arrhenius plot of the growth rate of P. pastoris SMD1168 grown on methanol and producing CBM-CALB. Dots represent experimental data. 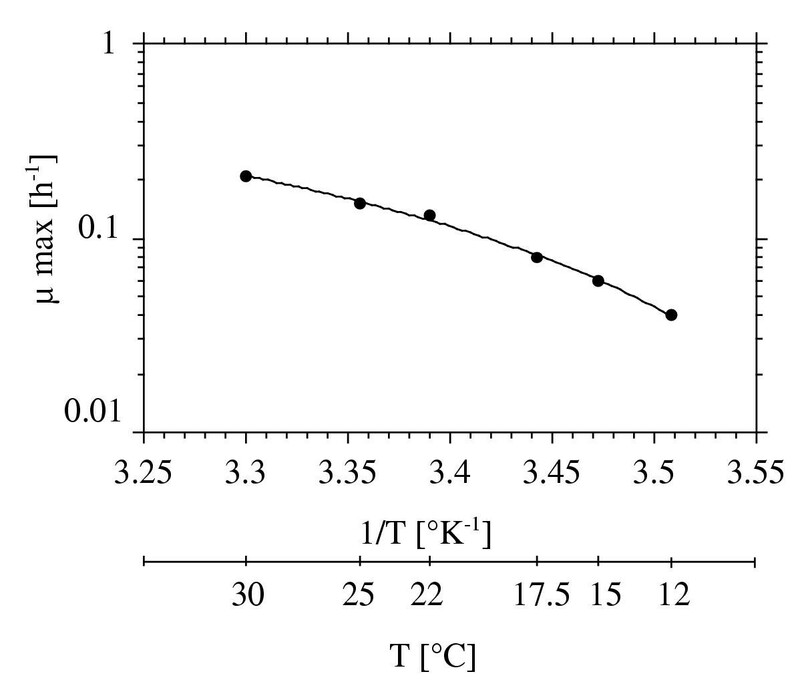 The temperature profile of a TLFB P. pastoris process is shown in Figure 3. It shows that the temperature drop required to keep DOT constant initially becomes very rapid. Due to the rather psychrotrophic properties of P. pastoris, the TLFB technique resulted in very low temperatures that can be difficult to maintain, especially in large-scale cultivation. The temperature reached 12°C at a cell density of 70 g L-1, a concentration which is far below what was reached with a corresponding MLFB process (Figure 4). For this reason a hybrid technique was used, in which the DOT was first controlled at the set point by the temperature, until the cooling capacity failed. 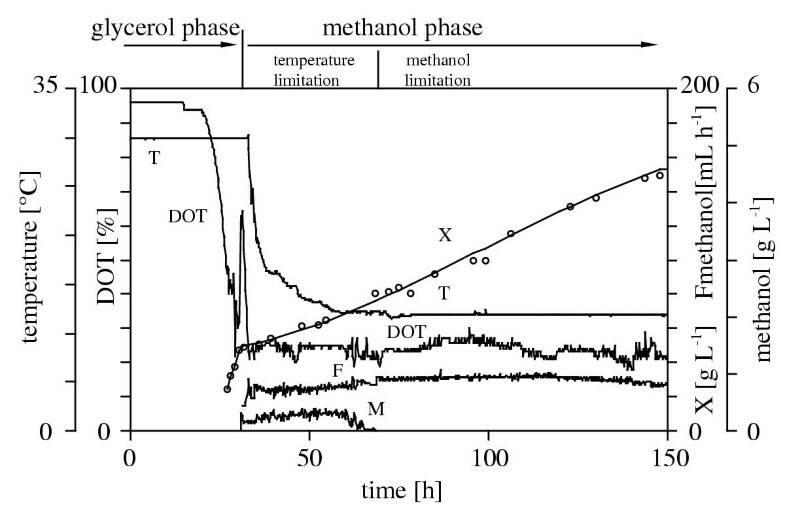 Then the control mode was switched to a methanol feed rate controlled DOT (Figure 3). The biomass growth continued and reached about 165 g L-1 after 175 hours (Figure 4). In previous work, the concept of maintenance and maximum cell concentration in P. pastoris culture was illustrated by a kinetic model . According to the model, more oxygen is used per methanol in the energy pathway (part of which is used for maintenance) than for the anabolic flux, i.e. 1.5 and 0.5 mole O2 per mole of methanol, respectively. Figure 4 shows a comparison between TLFB and MLFB processes. The demand of oxygen per methanol increases in the MLFB and it is higher than in the TLFB process. This indicates lower maintenance in the TLFB processes and as a result higher maximum cell concentrations are reached. Comparison of biomass concentrations (X) and consumption of oxygen per methanol (Yo/m) in two similar TLFB processes (filled symbols, solid lines) and in two similar MLFB processes at 30°C (open symbols, dotted lines). The methanol phase is divided in temperature limitation and methanol limitation only in the TLFB process. Both types of processes were controlled at DOT = 25% with similar oxygen transfer rate (stirrer speed and aeration rate in the same bioreactor). The possibility that cell death contributed to these results was investigated. Viability was estimated from flow cytometry of propidium iodide stained cells. Figure 5 shows that the percentage of dead cells increased at a constant rate in the TLFB process, and reached about 4% dead cells at the end. In the MLFB process, however, the frequency of dead cells increased rapidly during the initial methanol feed phase and reached a maximum of about 12% after about 40–70 hours of methanol feeding. Thus, the data indicate that the methanol is more toxic at 30°C than at the lower temperature applied in the TLFB process, in spite of the much higher methanol concentration in the TLFB process. Cell death in three TLFB processes (filled symbols) and in two MLFB processes at 30°C (open symbols). Solid line designated M represents the methanol concentration in culture broth in one of the TLFB processes. 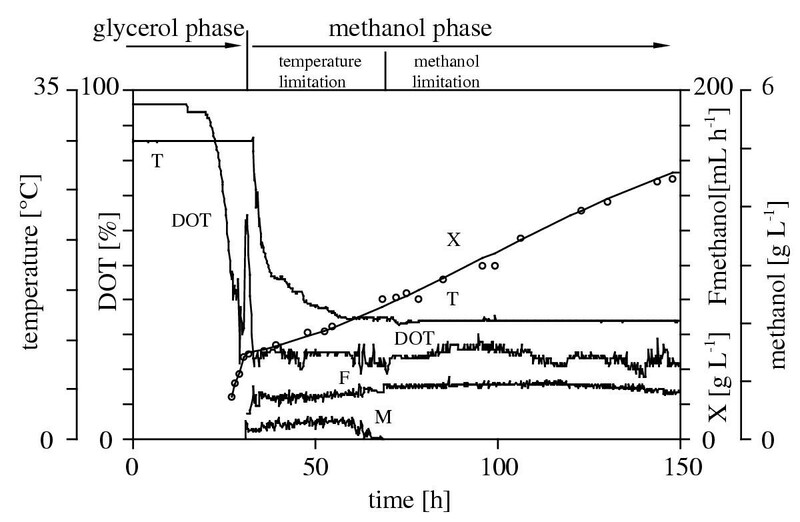 In the MLFB process, the methanol concentration is close to zero (not visible in the figure). To further analyse the different behaviour of TLFB and MLFB processes, the induction of the AOX was investigated. 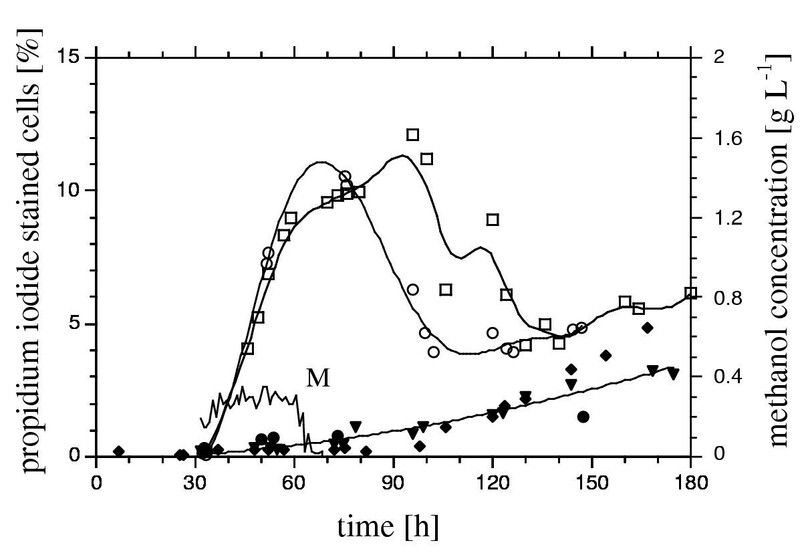 Figure 6 shows that there is no substantial difference in AOX activity during the first 30 hours after start of the methanol feed. Thus, different rate of production of toxic formaldehyde and hydrogen peroxide is not a likely explanation to the different viability patterns during this phase. However, an imbalance in induction of AOX, catalase and the formaldehyde consuming enzymes formaldehyde dehydrogenase and dihydroxyacetone synthase could result in different accumulation of toxic compounds in the cell. Comparison of the specific AOX activity in TLFB (open circles) and MLFB (closed circles) processes. 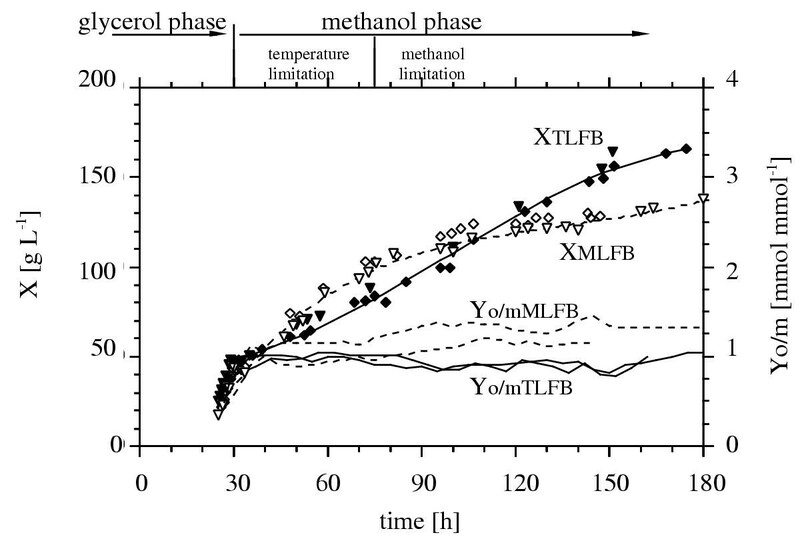 The temperature (T) and methanol concentration (M) profiles of the TLFB process are also shown. During the methanol limitation phases, the methanol signal is close to zero and not visible in the figure. It was suggested in the literature that the AOX1 promoter is catabolite-repressed to a substantial degree during the growth of wild-type cells (Mut+) on methanol at non-growth-limiting rate [13, 14]. 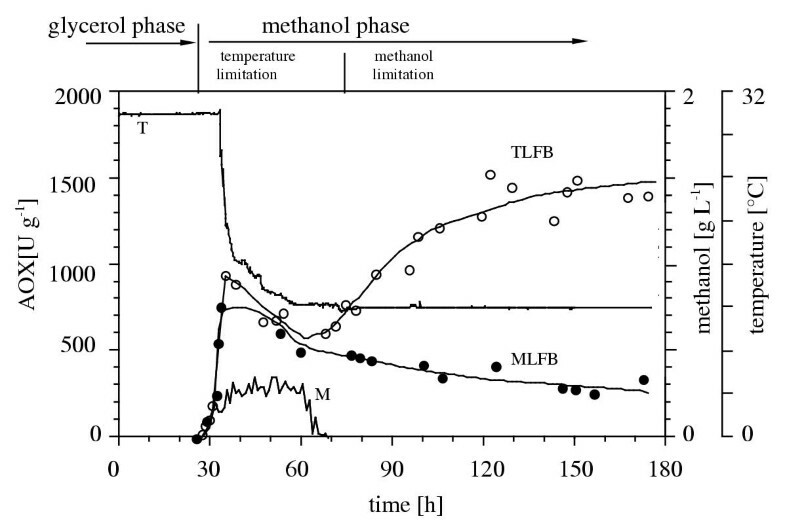 Figure 6 shows that the specific AOX activity in the MLFB process decreased soon after induction and continued to decrease even during growth on methanol at limiting concentration. In the TLFB process, the specific AOX activity after a slight decrease during the temperature limitation phase with high methanol concentration, gradually increased to a level 3.5 times that of the MLFB process. This suggests that AOX1 promoter is capable of much higher transcriptional levels in the TLFB process than in the MLFB process. The lipase activity and concentration were considerably higher in the TLFB processes than in the MLFB processes (Figure 7). The final product activity in the TLFB processes corresponds to about 2 g L-1 protein, while in the MLFB processes was about 1 g L-1. The deviation in the AOX activities of the two processes starts after about 80 hours of cultivation, and this is also when product concentration curves start to deviate. Lipase activity produced in two MLFB (open symbols) and three TLFB processes (filled symbols). Western blot analyses of the product in the MLFB process revealed accumulation of a 36-kDa protein corresponding in size to the recombinant CALB (Figure 8, panel A). It is likely that it is the result of a proteolytic cleavage in the vicinity of the linker between CBM and CALB, since this product did not stain with antibodies directed to the N-terminus of the CBM part (data not shown). Previous studies showed that this was the result of proteases of the serine type since the reaction was completely inhibited by PMSF . It has been suggested earlier that the extra-cellular proteolysis of recombinant proteins is partly due to release of proteases from dead cells . When corresponding analyses were made in the TLFB process, no visible proteolysis was observed (Figure 8, panel B). 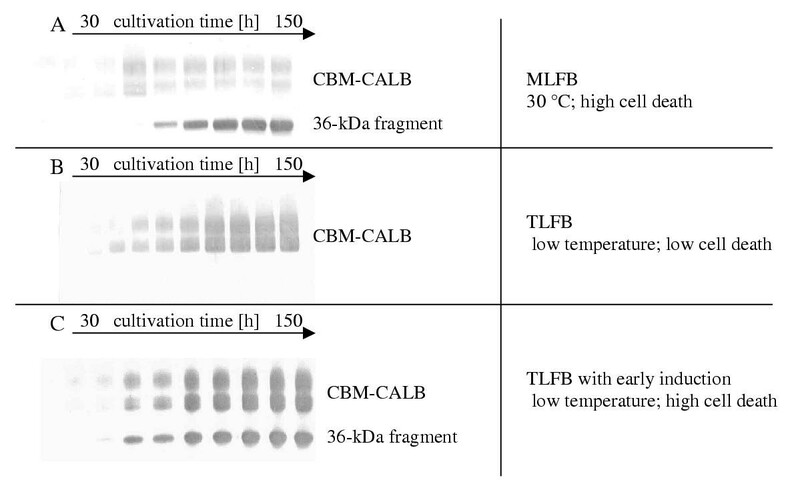 Two factors differentiate TLFB and MLFB processes which can influence proteolysis: temperature and cell death. 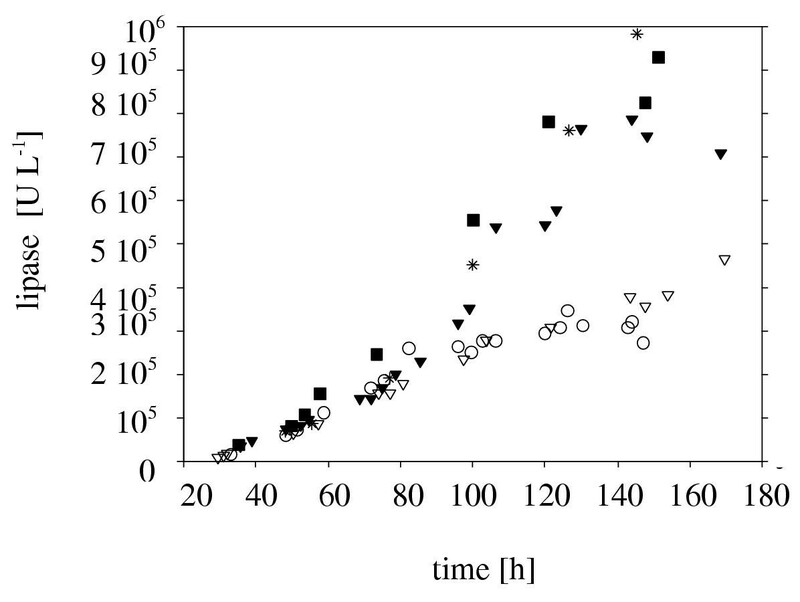 The cultivation temperature influences rate of proteolysis for the pure thermodynamic reason. Dead cells lyse and release proteases to the culture medium. Both factors are higher in the MLFB process. A: Western blot analysis of samples from the MLFB run at pH 5.0 and 30°C. B: Western blot analysis of samples from the TLFB. C: Western blot analysis of samples from the TLFB with an early induction. Antibodies directed against the CALB moiety were used. CBM-CALB appears as diffuse bands in the range 39–44 kDa due to glycosylation . To eliminate influence of temperature and investigate whether cell death influence proteolysis, a cultivation with high cell death and low temperature was performed. There was an early methanol induction in this cultivation. Cells were grown on methanol at non-growth-limiting rate (replacing the glycerol phase) before the temperature was decreased as with the TLFB process. Viability estimated from flow cytometry showed that the percentage of dead cells in this phase was about 15% (data not shown) compared to 0.2% in a glycerol-initiated TLFB process (Figure 5). During the succeeding TLFB phase with high percentage of dead cells and low temperature, Western blot analysis clearly shows accumulation of the characteristic 36-kDa protein (Figure 8, panel C). These observations suggest that the main cause of proteolysis is cell death and lysis and this can be avoided in the TLFB process. To investigate that the culture medium from MLFB process has higher protease activity due to release of proteases from lysed cells, another proteolytically unstable protein, XET, was used as substrate. XET was incubated in the cell-free culture medium from MLFB and TLFB processes after 140 hours. Figure 9 shows that the activity of the XET declines at a faster rate when incubated in culture supernatant from the MLFB process. The intensity of the XET bands on SDS-PAGE also decreased with incubation time (data not shown). This indicates higher protease activity in the culture medium in the MLFB process since incubation temperatures were the same. Comparison of XET stability in cell-free supernatants withdrawn from a TLFB and an MLFB process. Incubation temperature was 22°C in both cases. The dilemma with high cell density cultures is that the proteolytic activity is also likely to increase with the cell density. The lower cultivation temperature in the TLFB process results in reduced extracellular proteolysis for two reasons: firstly, for pure thermodynamic reasons and secondly, due to reduced protease release from cell lysis. The higher AOX activity in the TLFB process is probably another mechanism behind the higher final product concentration in this process. Pichia pastoris SMD1168 is a protease-deficient strain (his4, pep4) obtained from Invitrogen (Carlsbad, CA, USA). The design of the plasmid coding for the fusion protein CBM-CALB, composed of the cellulose-binding module (CBM) from Neocallimastix patriciarum cellulase (Cel6A) and Candida antarctica lipase B (CALB), is described elsewhere . Inoculum was produced in a 1 L shake flask with 100 mL buffered minimal glycerol inoculum medium: yeast nitrogen base without amino acids, 134 g L-1; phosphate buffer (132 mL of 1 M K2HPO4 and 868 mL 1 M KH2PO4), 100 mL L-1; biotin, 400 μg L-1; and glycerol, 10 g L-1. The initial pH was 6. Cells were grown for 14 h at 30°C on a shaker with 260 rpm, which resulted in an OD600 between 2 and 5. The shake flask culture was transferred to the fermentor with 3 L fermentor medium: H3PO4 85%, 26.7 mL L-1; CaSO4 *2H2O, 0.93 g L-1; K2SO4, 18.2 g L-1; MgSO4 *7H2O, 14.9 g L-1; KOH, 4.13 g L-1; glycerol, 40 g L-1; and trace element solution, 4.3 mL L-1 of the fermentor medium. The trace element stock solution contained: CuSO4 *5 H2O, 6 g L-1; KI, 0.8 g L-1; MnSO4 *H2O, 3 g L-1; Na2MoO4 *2H2O, 0.2 g L-1; H3BO3, 0.2 g L-1; CaSO4 *2H2O, 0.5 g L -1; ZnCl2, 20 g L-1; FeSO4 *H2O, 65 g L-1; biotin, 0.2 g L-1; conc. H2SO4, 5 mL. When the glycerol was consumed after about 27 h, a feed containing 555 g L-1 glycerol and 12 mL L-1 trace element solution was started. The initial feed rate was 38.5 mL h-1 and was increased at a rate of 0.18 h-1 to force the cells to grow at a specific growth rate of about 0.18 h-1. After 3.5 hours when cell concentration was approximately 42 g L-1 dry weight (about OD600 = 120) the glycerol feed was replaced with a feed containing 780.6 g L-1 methanol and 12 mL L-1 trace element solution. The methanol feed increased exponentially from an initial 3.5 mL L-1 h-1 feed rate. When DOT reached about 25%, a constant methanol feeding was applied and adjusted to keep DOT at 25%. Under these conditions, the methanol concentration was below the detection limit of the instrument (< 50 mg L-1). Fed-batch cultivation was carried out in a 10 L standard bioreactor (Belach Biotek AB, Stockholm). The agitation, pH, temperature, DOT, pressure, air flow rate, pump speed, and antifoam addition were automatically controlled. All these parameters and the signals for bioreactor weight, feed reservoir weight, NH4OH reservoir weight, accumulated antifoam pump run time, and outlet gas composition (CO2, and O2), were monitored and logged. The fermentation was carried out under the following conditions: temperature, 30°; pH 5.0 controlled by the addition of 28% NH4OH. DOT was controlled at the level of 25% air saturation by agitation up to 1000 rpm with aeration rate 6 L min-1. Foaming was automatically controlled by means of a level electrode and antifoam A (A5758, Sigma-Aldrich, Stockholm). The temperature limited fed-batch process was initiated and induced in the same way as the MLFB process until DOT reached about 25%. Then the temperature controller was programmed to use this DOT as a set point. Thus, at DOT below the set point the temperature was decreased while it was increased when the DOT was above the set point. The methanol concentration was controlled at 300 mg L-1 by means of the methanol analysis. The cooling capacity of the bioreactor did not permit control at a temperature lower than 12°C. To avoid oxygen limitation when this temperature was reached, the control mode was switched to constant temperature with methanol limitation, using a constant feed rate adjusted to keep DOT at about 25% air saturation. Shake flasks containing 100 mL medium with 1 g L-1 methanol as sole carbon source were inoculated to a cell density of OD600 = 0.05 with P. pastoris cells already growing on methanol and incubated at different temperatures between 12 and 30°C. Samples were withdrawn at various times for measurement of cell density at OD600 nm. When OD600 reached 1, the culture was supplemented with 1 g L-1 methanol. The specific growth rate was constant in the OD range 0.1–2 and used as μ-max for the incubation temperature. During the temperature limited fed-batch process, instrumental control of the methanol concentration at a non-limiting level becomes essential. The methanol concentration in the medium was estimated from the outlet gas analysis (Industrial Emissions Monitor, Type 1311, Innova, Denmark). A calibration curve was obtained by adding increasing amounts of methanol to the bioreactor containing sterile culture medium. The concentration was linearly dependent on the gas analyser signal with a slope that was temperature-dependent and determined to obtain the correct methanol concentration during the temperature limited process. The methanol analysis was used to adjust the methanol feed rate to ensure there is no over-feeding during the AOX induction phase. During the TLFB process, the signal was used for automatic control of the methanol concentration at about 300 mg L-1. The methanol feed reservoir was placed on a balance and the feed rate (F) was calculated from the logged balance signal. Dry weight (X) of the cell suspension was determined by centrifugation of 5 mL cell broth in a pre-weighed centrifuge tube, followed by washing with distilled water and drying to constant weight at 80°C in an oven. For analysis of viability, a Partec PAS flow cytometer (Partec GmbH, Münster, Germany) equipped with a 488 nm argon laser was used. Samples taken from the fermentor were diluted with PBS (0.16 M NaCl, 0.003 M KCl, 0.008 M Na2HPO4 and 0.001 M KH2PO4, pH 7.3). For staining, 25 μL of a stock solution containing 200 μg mL-1 propidium iodide (Sigma, P-4170), dissolved in water, was added to 975 μL of diluted sample at room temperature. For concentration determination, the Partec true volumetric absolute counting function was utilized. Samples were analysed, without prior incubation, at a data rate of about 1500 counts sec-1. A count of 50,000 was collected in each measurement and the average value of triplicate analyses was used. Measurements were calibrated using 3 μm diameter fluorescent beads (Standard 05–4008, Partec GmbH). Samples from the bioreactor were centrifuged at 4200 rpm and the supernatant used for lipase assay. The lipase activity towards tributyrin was measured at 25°C and pH 7.5 using a pH-stat (TIM 900 Titration Manager, Radiometer, Denmark) and 100 mM NaOH solution. The substrate solution (2% gum arabic, 0.2 M CaCl2 and 0.2 M tributyrin) was emulsified by sonication (Branson 250, 30 W) for 2 min. To start the reaction, 20 μL of the sample was added to 1.5 mL substrate solution under vigorous stirring. One lipase unit corresponds to one μmole of NaOH per minute. The concentration of CBM-CALB in grams per liter was calculated from the lipase activity and the previously determined specific activity of CBM-CALB, which is 500 U mg-1. The specific activity was determined by Gustavsson et al. using active site titration . The Western blot analysis of CBM-CALB is described elsewhere . Anti-FLAG M2 antibodies (Sigma) raised against the FLAG peptide fused to the N-terminus of the CBM were used to show full-length CBM-CALB. Antibodies raised against CALB were used to visualise truncated protein products. The membranes were scanned and evaluated by using the computer software ImageMaster (Pharmacia Biotech). To compare the proteolytic activities in culture supernatants of TLFB and MLFB processes, the enzyme xyloglucan endotransglycosylase (XET) was used as substrate for proteolysis. It was previously shown that XET is proteolytically degraded when produced in P. pastoris bioreactor culture (M. Bollok, unpublished data). After 140 hours of cultivation, culture supernatants from TLFB and MLFB processes were obtained by centrifugation at 4200 rpm. The XET was added to shake flasks with culture supernatants at a final concentration of 1.1 U mL-1 and incubated at 22°C. Samples were withdrawn periodically and subjected to XET activity assay and SDS-PAGE. The activity of XET was determined colorimetrically according to Sulova et al. . The reaction mixture contained 50 μL xyloglucan (XG, 1.75 mg/ml), 50 μL xyloglucan oligomers (XGO, 3.5 mg/ml), 50 μL citrate-phosphate buffer (50 mM), pH 5.5, and 50 μL of sample containing the enzyme. The XGO was prepared and kindly provided by Professor Tuula Teeri. The blank contained no XGO. The mixture was incubated at 30°C and the reaction was stopped by addition of 100 μL HCl (1 M), 800 μL Na2SO4 (20% w/v) and 200 μL iodine reagent (0.5% I2 + 1% KI). The reaction tubes were stored in the dark for 30 min. The absorbance was measured at 620 nm. The XET activity was expressed as the absorbance difference (ΔA620/min) between a pair of tubes with and without XGO. Samples from the fermentor (5 mL) were centrifuged at 4200 rpm and the volume of supernatant measured. After removal of supernatant, the cells were washed with 5 mL 100 mM potassium phosphate buffer, pH 7.5. After repeated centrifugation, 100 mM potassium phosphate buffer was added to the cells. The volume of phosphate buffer added was the same as volume of measured supernatant from the first centrifugation. The cells were then disintegrated in a French press (SLM Aminco, USA) at 800 bar. Alcohol oxidase was assayed polarographically with a Clark-type oxygen electrode (Medelco AB, Sweden) at 37°C in air-saturated buffer. The reaction mixture (1 mL) contained 100 mM potassium phosphate buffer (pH 7.5), 2000 units of catalase (from bovine liver, Sigma-Aldrich, Sweden) and 10 μL of the disintegrate from French press. The reaction was started by adding 10 μl of 10 M methanol. Alcohol oxidase units are expressed as μmol methanol oxidised per min. Financial support from the Knut and Alice Wallenberg Foundation and the Swedish Center for Bioprocess Technology to MJ, from the Swedish Institute to PG and from EC (QLK3-CT-2000-51211) to MB are gratefully acknowledged. MJ made the majority of the fermentations, analyses and data treatments and did the project planning in co-operation with the project leader. PG assisted in the planning and performance of the cultivations, made most of the AOX analyses and edited the manuscript. MB contributed with the XET-based method for comparing protease activities in TLFB and MLFB. FW did the flow cytometry analyses. SOE was project leader.